3 Bed 2.5 Bath Custom Cabin. Has BEAUTIFUL stained glass windows, skylights & more! One of our most popular rentals and is truly a design of creative work! This luxurious vacation cabin offers the perfect accommodation for three couples or a family of up to seven. 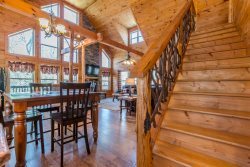 Only 8 miles from Helen GA, this property is strategically located so you can reach other popular destinations in the North Georgia Mountains. Unforgettable features several PRIVATE porches off each floor, stained glass windows, SKYLIGHTS, heart pine bars dating back to Columbus’ day, the latest kitchen conveniences, hardwood floors and GRANITE counter tops. Indulge in the HOT TUB on a covered porch or RELAX in the HUGE indoor JACUZZI located in the master bathroom. Get together in the loft area for a game of pool or to watch your favorite TV show. Cozy up in the living area in front of the wood fire place, watching your favorite shows or enjoy a tasty meal using our fully stocked kitchen or the outside BBQ charcoal grill. At night, sit around the fire pit and enjoy some roasted marshmallows while you share your tales and stories with family or friends. Most likely you will see a deer family crossing by! Enjoy the privacy and tranquility this place has to offer. Located in our Blue Creek Development, with only a short walking distance from our Walking Trails and Private stocked trout pond, this cabin makes a great vacation for anyone looking to have fun and relax.